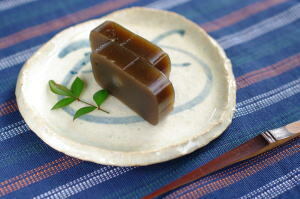 Yokan ('羊羹[ようかん]', is classified into sweets), is known as Red Bean Agar in English, and 羊羹 (Yánggēng) in Chinese. It is the Japanese style sweets. Agar, Water, Sugar, Red Bean Paste.